Labour Leadership election – volunteer! Some members have been asking how they can help in the campaign to re-elect Jeremy Corbyn as Labour Leader. Kensington Labour is not running an active campaign over August – despite our hugely increased membership (from 300 to 1500 in 18 months) we are still a small team at present who need a break like everyone else. If you’d like to join the Kensington Labour team of volunteers, email us on http://kensingtonlabour@gmail.com and we will add you to the list for our next campaign. 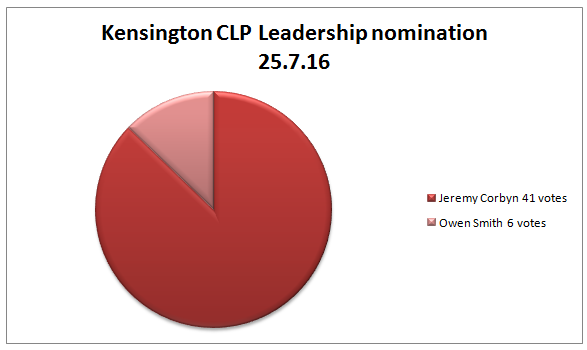 On Monday 25 July, in accordance with Labour Party rules, Kensington CLP held a meeting to debate and select our nomination for Leadership candidate. The meeting was polite, respectful and comradely, Kensington members applauding speeches made for both candidates. 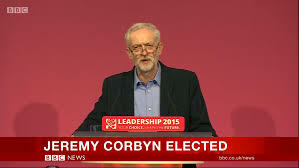 The result is below, and repeats our nomination this time last year – Kensington Labour voted overwhelmingly to support our democratically elected Leader, Jeremy Corbyn MP. All eligible members will also vote individually; ballot papers should be with you in a couple of weeks. Previous Previous post: YOUR VOTES – WE’RE CONFUSED TOO! Next Next post: AXE THE HOUSING ACT!